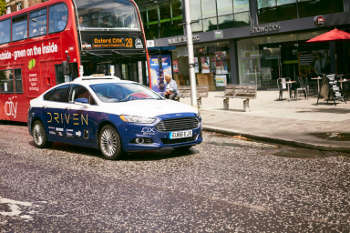 There is currently no answer to key ethical issues around autonomous vehicles (AVs), such as whether they should be programmed to prioritise the safety of occupants or pedestrians, the head of Britain’s leading transport research body has said. Rob Wallis, CEO of TRL, told the London Assembly Transport Committee that the issue was significantly more difficult to solve than other ethical, regulatory and safety issues around AVs such as criminal liability and cyber security. He said: ‘All of those are just changes to the law: the right people need to get around the table and work through those over time and remove those barriers so the industry can continue to innovate and bring the safety benefits to the market place. He told the committee: ‘From a regulatory point of view, there are real barriers to overcome. The uptake and usage [of AVs] is not probably held back by the development and innovation around technology but it’s more these barriers about how do we bring new and innovative technologies into society. Mr Wallis also cited issues around the criminal law, ‘civil liberties around personal injury’, insurance, data privacy and cyber security. The committee is conducting an inquiry into ‘Future Transport’ in the capital.